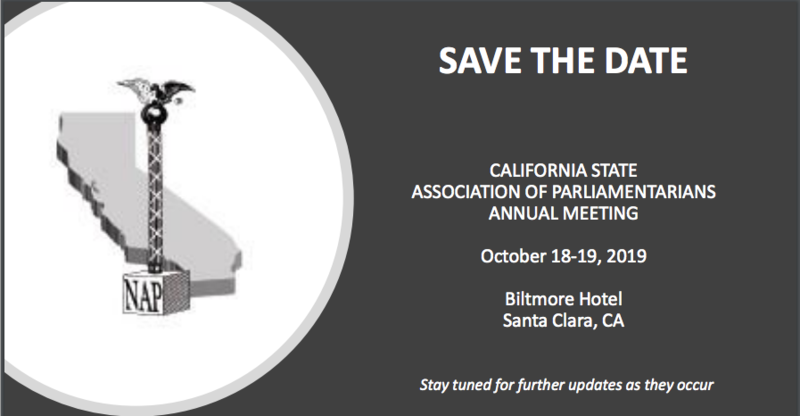 Our 70th CSAP Annual Meeting was held at the beautiful Embassy Suites in Sacramento next to the Tower Bridge and Sacramento River. We were off to a rousing start on Friday evening with David Mezzera’s interactive education workshop on “The Meeting from H.E.L.L.” Participants were waving their stop signs on pixy sticks to call out the meeting “flubs” that were made. Saturday morning, President Esther Heller gaveled our meeting to order, and, after the opening ceremonies, the day began. We had 39 members and 3 students attending. Other workshops of the day were Sandra Sanders giving us tips on “How to Navigate Robert’s”, Bruce Rick (“CALL NOW”) showed us how his unit uses telephone conferencing successfully. 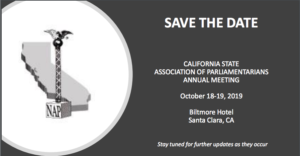 Scott Burns presentation was “Henry Robert Goes to Jail or What Every California Parliamentarian Needs to Know about CA Law”. Lorenzo Cuesta showed us different approaches to writing a parliamentary opinion in “No One Cares for Your Opinion, Unless it’s a Parliamentary Opinion.” Brian Ebbert, RP, Floor Director for the California Assembly Speaker Anthony Rendon was our keynote speaker before lunch, sharing stories about how parliamentary procedure is used in the CA Legislature. There was a surprise when Lorenzo Cuesta was presented with a Proclamation from the CA Legislature for all his work with college students. Amending submittal of bylaws amendments by changing two MAL’s to at least three members—passed. Eliminate the role of historian—failed. Restrict officers from two to one consecutive term—passed. Defines a specific time frame for giving notice for units to submit names of proposed candidates for any CSAP office—passed. Our awards banquet was a relaxing way to end the day, even when we lost power! President Heller expressed her gratitude to board and committee members with individual “goodie bags” and…..chocolate!